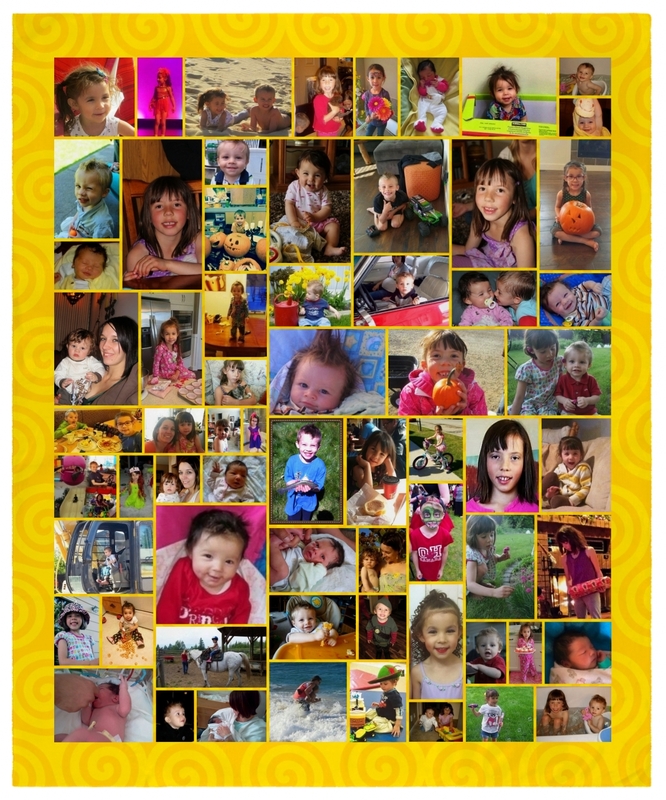 The Gift of Personal Renewal … | Miracles! Your Center for Well-Being Inc. I knew it was time. I love, love, love my work, but could feel that my usual level of enthusiasm was waning in the mornings. 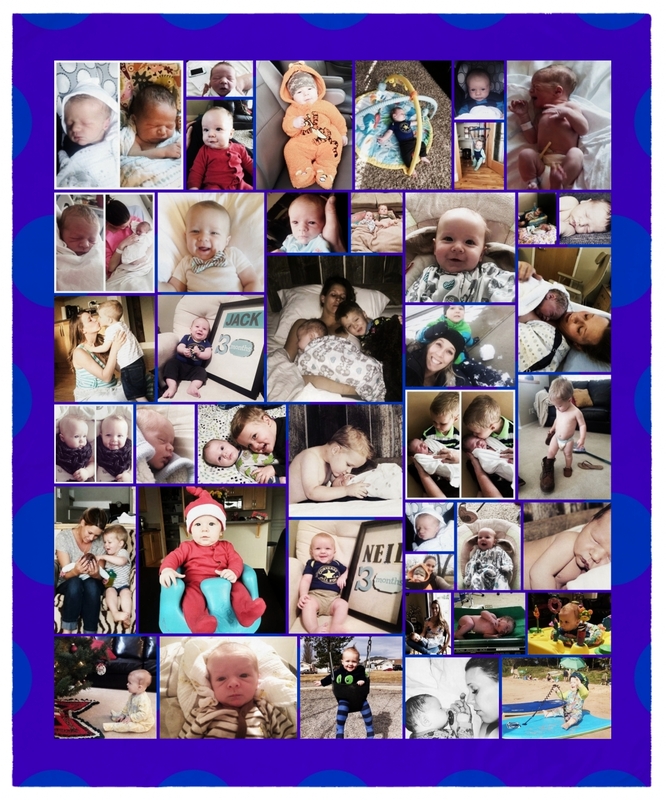 2016 was a particularly challenging year for me … both in terms of managing other people’s needs/crises/calls for care and also in some deeply personal ways that I may speak about in another blog … some other day. All in all, by the beginning of September 2016, I was feeling hard pressed to do what I normally do with my usual sense of passion and pleasure. I can generally force myself to push through feelings of fatigue in order to get things done … so that I can cross all the shoulds/musts/oughts off my ‘to-do’ list … but this malaise felt very different. I sensed with certainty that I could not keep soldiering on without generating some dire consequences. I had to concede that I was wilted and withered and pretty much depleted in terms of my own emotional reserves. As a counsellor, I am prone to invite folks to be more compassionate with themselves … to make more time for self-care … to be a little kinder to themselves and give their own needs highest priority for a change. And so, as my enthusiasm increasingly waned, I knew it was imperative for me to attend my own lecture and amp up my ongoing efforts towards personal renewal. I knew that my clients would be short-changed if I did not pay special attention to the emptiness of my own bucket. They deserve the best ‘me’ that I can offer them. And, the very best me is one who is well rested and adequately nourished (emotionally, mentally, physically and spiritually) so that I can be fully present when I am seated before them. And so, I was inspired to take care of me so I could continue to take care of my clients. 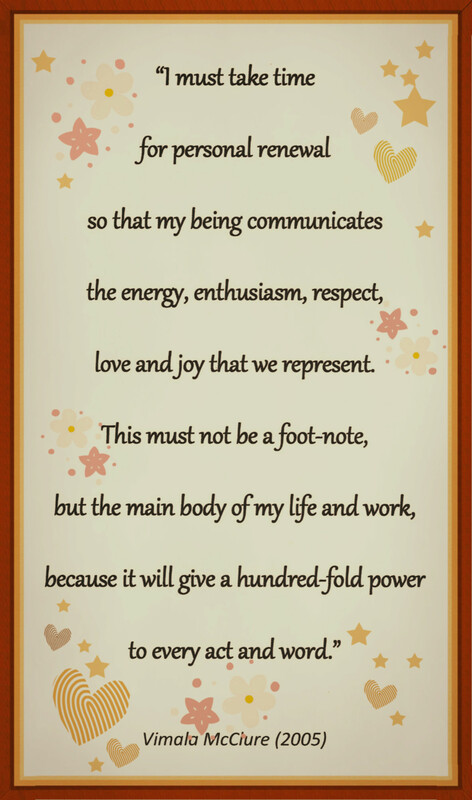 It has always been especially important to me that “my being communicates the energy, enthusiasm, respect, love and joy” that my clients deserve “because it will give a hundred-fold power to every act and word” we exchange during their sessions with me. What?? My understanding of a sabbatical is that people take an extensive period of time away from their regular duties in order to study and/or learn something new. 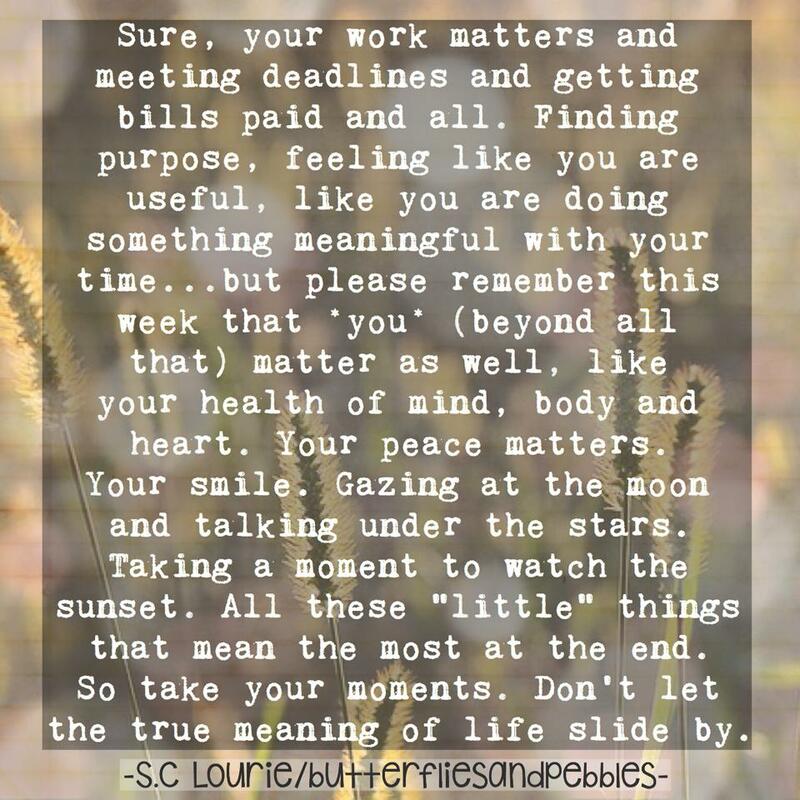 It initially sounded like utter nonsense to me … but by the time I pulled into the parking lot at my office, it had occurred to me that perhaps I needed time away from the ‘giving’ that is my usual way of showing up in the world (both personally and professionally) and, instead, carve out some space to nourish my own soul through ‘receiving.’ Maybe my sabbatical would be about learning to focus a little less on others and listen more compassionately to the whispers of my own soul. With that insight, I could feel the faintest but most unequivocal squeal of delight escape from somewhere deep in my heart … and … I noticed the corners of my lips involuntarily turned upward. So, I walked into my office, switched on my computer and immediately booked my ‘sabbatical.’ I knew I had better act immediately upon my intuitive wisdom … before my head talked martyr me right out of it. Slow but sure, I rescheduled all my commitments for the entire month of December 2016 … except for a mammogram. I had already rescheduled three times … and … I reckoned that was a form of self-care that I should not delay once again. And when my mother-in-law passed, I stepped up and offered my assistance with a full and open heart … but other than those times, my preference was to start each day without an agenda. Even before my sabbatical officially commenced, I consciously committed to ‘doing’ less for others and simply ‘being’ more present, aware and attentive to my own needs, wants and desires. I suspected it would be a bit of a challenge to sit in the discomfort these changes would generate and reckoned I needed as much practice as I could get. One of my first steps leading up to my ‘self-care’ sabbatical emerged when I got brave enough to publicly share a blog I wrote exploring my life long pattern of suffering in silence. I gave myself permission to speak up on my own behalf about how I had been neglecting my own inner pain. It was deeply cathartic to give myself voice, but at the same time, I felt so incredibly exposed that I experienced quite the vulnerability hangover after I published it. I had been quite courageous in calling a spade a spade and I expected some people might judge me harshly. Perhaps some did … but much to my surprise, I ended up feeling so profoundly touched and generously supported in the ways people kindly and compassionately reached out to me (both privately and publicly). Yes, sharing my truth so transparently had led to some very meaningful connections. And speaking of connections, somewhere around the same time, I listened to Glennon Doyle Melton’s “Love Warrior” on Audible. This extra-ordinary memoir fortified my intention to drop the “representative” (the person I feel safe sending out in the world to appropriately ‘represent’ me – the one who typically silences me) and step into more truth-telling, transparency and authenticity (honoring the scared, and vulnerable soul hidden behind the representative). The book has since been chosen for Oprah’s Book Club … and … as people resonated with the juicy joys of this conversation I received inquiries/suggestions from many hoping I would offer a book study. I didn’t have it in me at that time to run a group, but I didn’t want to miss out on the opportunity to keep this type of discussion alive in my world. So, I gifted myself with a chance to meet very informally with just a select few strangers who had specifically reached out to me when I posted my blog. I didn’t really know them, but I sensed that they might be ‘my people‘ and wanted to get to know them better. It has been entirely refreshing … and … very nourishing for my spirit! It’s funny how you can feel so at home with people you don’t even know. I thank myself for being bold enough to ask them to come over and chat a couple of times as I was gearing up for my sabbatical. Given that my sabbatical officially commenced in December, my husband agreed to shoulder all the responsibilities of Christmas for the first time in our 40 years together. I can’t even explain how much it delighted me to think that someone else was going to fuss and bother in order to make the season merry and bright for me. And, in the spirit of truth-telling, I have to acknowledge that it didn’t really turn out the way I had imagined … but … it was a very rich experience in countless other ways that I never expected. I share more about the joys, challenges and learning that came with surrendering this responsibility in another blog entitled “A Slow Burn and the 2016 Christmas Chronicles”. In order to best honor my self-care intentions during my sabbatical, I resisted any and all urges to attend to any and all things that could be handled by others. I attended a couple of meetings at work, but only because I really wanted to connect with my colleagues. They are amazing souls and being with them nourishes me. I especially enjoyed sipping my coffee in the dark, quiet of the early mornings … savoring the solitude and stillness. It’s always been my favorite part of the day. 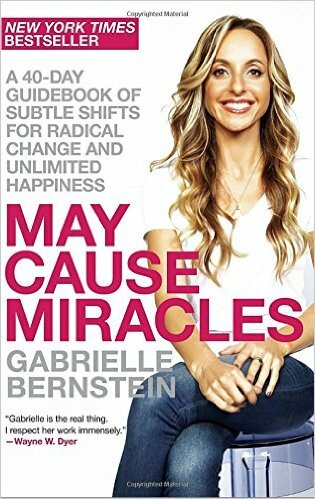 I also started a 40 day practice inspired by the teaching of A Course in Miracles and compiled into a book called May Cause Miracles: A 40 Day Guidebook of Subtle Shifts for Radical Change and Unlimited Happiness. One if the assignments is to schedule specific mantras called “miracle moments’ into your smart phone that will regularly alert and remind you to shift away from our habitually negative mindsets (judging, worrying, fearing) into a more love-based perspective (compassion, generosity of spirit, acceptance). More often than not, we cause ourselves unnecessary suffering because we spend so much energy judging things that have already happened … things that we have no power to change. The ‘miracle’ lies in learning how to be more accepting of the flow of the Universe … even if/when we don’t agree with what is happening. This is not a passive stance … but rather, a significant shift in how we choose to respond to the situations, events, circumstances and people occurring in our lives. Yes, we always have the power to choose how we are going to respond. Like … for instance, with my mammogram. It was scheduled for December 9th in Calgary (3 hours from here). In order to turn that undesirable experience into something more fitting of my intentions for personal renewal, my bestie agreed to accompany me. We had planned to give each other the gift of time for our birthdays (and maybe a hike in the mountains in June or July) but life had gotten too busy for us to actually do it. 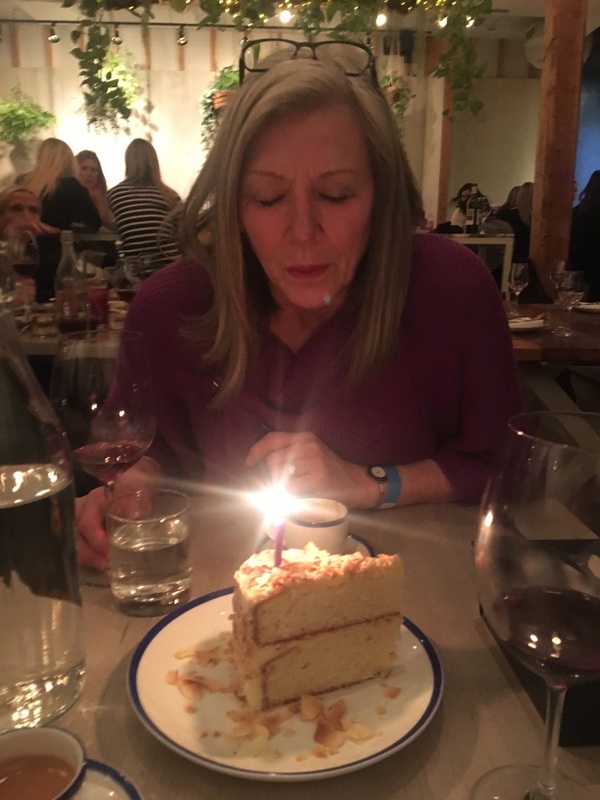 So, we opted to leave for the big city a day early and spend three days and two nights away where we could celebrate our birthdays and generously feed our hearts, minds and bodies! And that we did!! 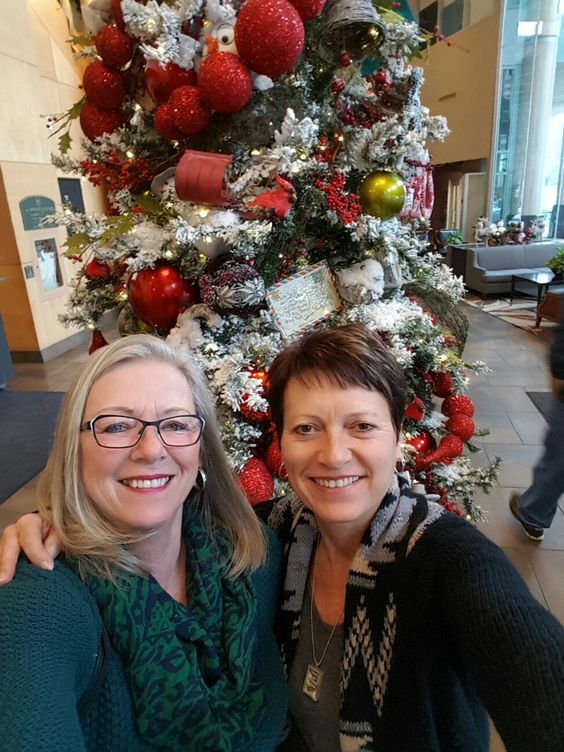 A nice little selfie … taken in the lobby of our hotel! If you ever have a chance to go to the Stillwater Spa in Calgary Alberta Canada … DO IT! I received an absolutely phenomenal 90 minute relaxation massage. The facility is spectacularly nurturing and calming … and … my insurance covered the entire cost!! And, while en route to Calgary, we discovered the Trip Advisor‘s #1 rated Vietnamese Restaurant in Okotoks, Alberta. It’s called Pho Hoai ! If you ever get there … be sure to have the Chicken Sate!! It’s not on the menu but they kindly made it for me anyway! Deeelish!! And, one evening, after taste-testing the reduced price ‘happy hour house wine’ at supper … we opted not to settle. We realized that we tend to ‘make due’ more often than not. We treated ourselves to something that delighted our palates instead. It cost more, but we determined that we were worthy of the extra investment. It was a simple but meaningful opportunity to be more kind and loving to ourselves. And, as we savored our sips, we high-fived each other for indulging our own preferences in that moment. 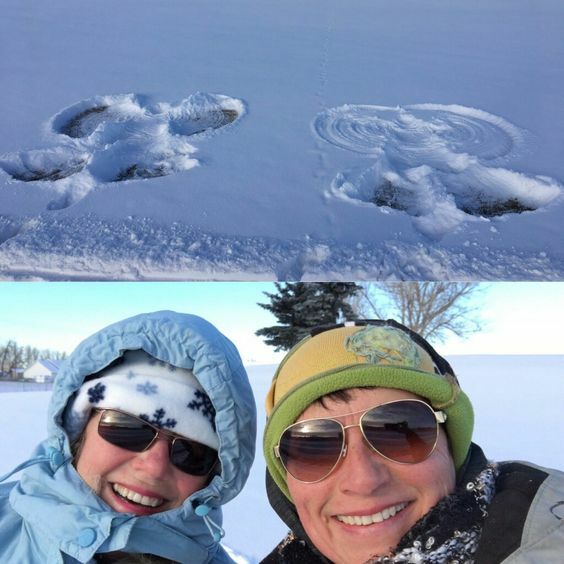 And … because we always love to take long walks/hikes together, we capitalized upon something called the ‘Plus 15′ connecting all the buildings in the downtown core of Calgary, Alberta. We would normally have walked outdoors, but the temperatures (with the wind chill) were dreadfully cold. 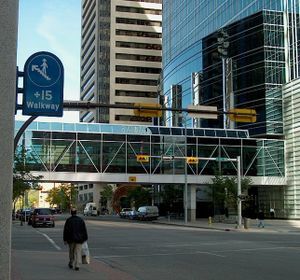 The Plus 15 or +15 Skyway network in Calgary, Alberta, Canada is reported to be the world’s most extensive pedestrian skywalk system … with a total length of 18 kilometers (11 miles) and 62 bridges. The system is apparently so named because the skywalks are approximately 15 feet (4.5 meters) above street level. We put a lot of miles on during those few days!! Oh my … and we howled with laughter every time we heard the ‘miracle moment’ reminder that we had cheekily recorded onto my smart phone. Imagine the looks on all our faces as the sales clerks and fellow shoppers heard (on each and every hour): “We are playful, spontaneous bad asses out on the town.” And, if you knew how far removed those adjectives are from our conscientious, responsible, reliable, well-behaved, social worker personas, you’d have a deeper sense of the hilarity of it all. And, at the suggestion of a very sweet soul and colleague, we finished off the weekend by each having a Tarot Card reading by ‘Carl’ at The Divine Mine! This new-age store front offers a plethora of divinely inspired services. I’d never had my cards read before and am happy to report that it was a very rich experience. It was also very affirming. It was uncanny how accurately the reading reflected things that were going on in my life. I look forward to taking another road trip with my three daughters and re-experiencing the mystery and magic of it again with them! During my sabbatical, I also had the opportunity to catch some morning television . Ever watched The Marilyn Denis Show? It’s a Canadian talk show and it’s entirely entertaining! I thoroughly enjoyed the various segments on home decor/design, fashion musts/mistakes/makeovers, food, drink and fun and frolic!! I really think I would like to be Marilyn’s friend. I mean it. And speaking of friends … I knew it would be nourishing for my soul to book some time together with two of my favorite friends. Our opportunities to connect have diminished over the years, but on this day, we sipped some Malbec, chuckled, snacked on some nice appys, chuckled, and then had a tasty supper together and chuckled some more. We might have shared a tear or two as well. Yes. We shared some smiles, opened our hearts and even posed for a few selfies!! I so deeply appreciate these glowing souls. If you would like,to get to know them better, you can read more about them in a blog I wrote a few years back which pays tribute to them. Beneath all the layers we hide behind to protect ourselves … we are just angels in the making … aren’t we? And since my mother-in-law just passed away in October, it was to be our first Christmas without her … and … her birthday was Christmas eve. Her absence would be deeply felt because my daughters were so very close to her. 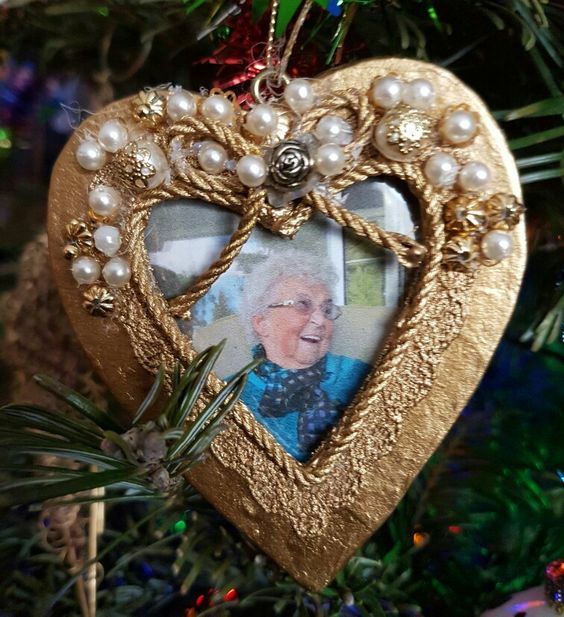 And so … in order to honor her importance in their lives, I created a heart-shaped picture ornament of her for each of them … so she might adorn their Christmas trees forevermore. Nell Lanser … December 24, 1928 – October 9, 2016. I also decided to gift myself with a picture ornament of her. And … in the spirit of honoring my own losses, I created one of my mom and my dad (who have long since passed as well). 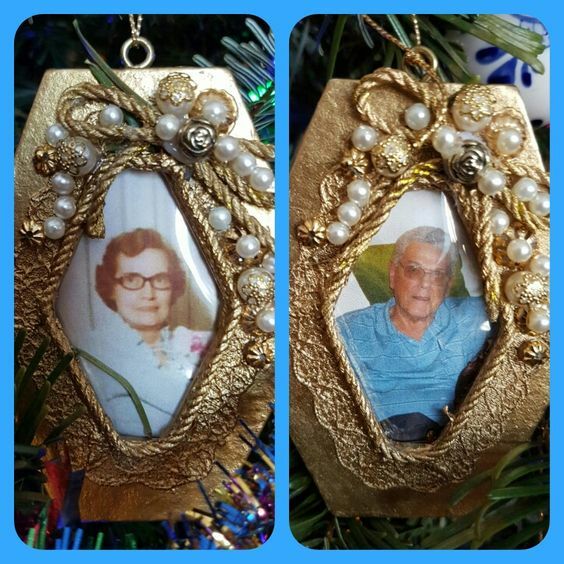 They remain forever in our hearts and it sparked so much gratitude in my spirit to see each of them lovingly gracing our tree in the antique looking gold paper and pearl beaded picture holders. I look forward to seeing them again next year … and … all the years after that. I also enjoyed a juicy and emotionally nourishing FOUR HOUR long distance telephone conversation with my grade school friend Sari. 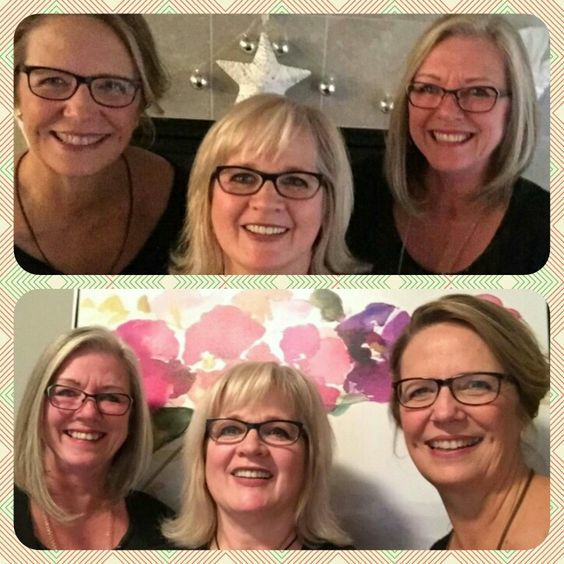 We’ve been friends for over 50 years but we don’t get to connect very often because we live hundreds of miles apart so it’s not uncommon for us to have lengthy chats, but I think this set the record for a phone call. It takes a special relationship to survive thrive despite the lack of attention ours gets. I’ve also written about what makes Sari so endearing and special to me. I rarely go to the theater anymore, but while I was on sabbatical, my hubby and I went to a matinée of Collateral Beauty. I highly recommend you see it. We sat in a unique place near the front where we could rest our feet on the railing behind the seating area for the disabled. We finished off the gargantuan popcorn (mostly) … with gusto and without apology … even before the show began. The story line was so compelling … and honestly … so very consistent with where I have been residing in my own emotional self-development. I shall carry its meaningful message with me as I move through the minutes, days, weeks and years that are yet to come. 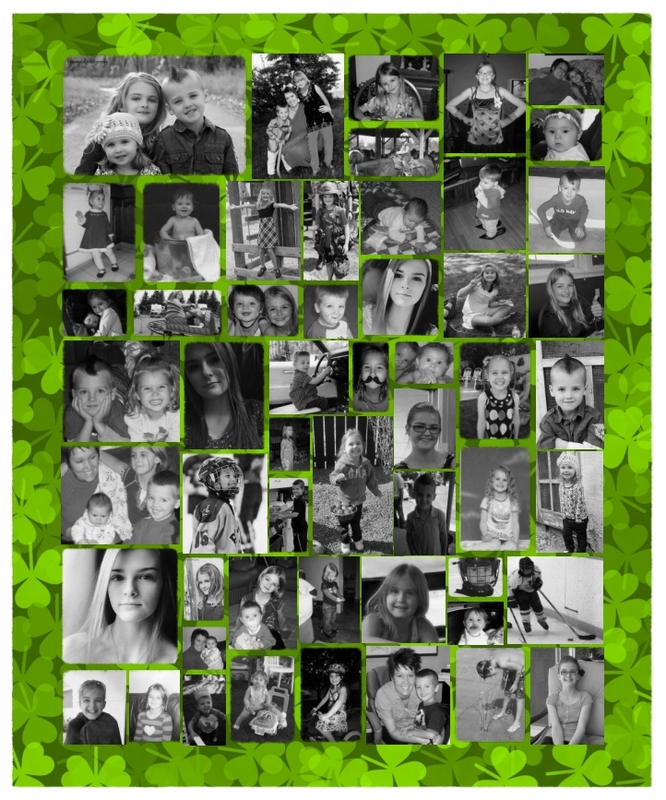 In fact, some of the ‘collateral beauty’ I noticed in making the blankets and creating the Christmas ornaments was all the memories that were stirred as I turned the pages on ALL our photo albums. As reflected in the photos, there has been such extraordinary beauty tucked into my life. Really. Even in the hard times. And, I remain grateful. 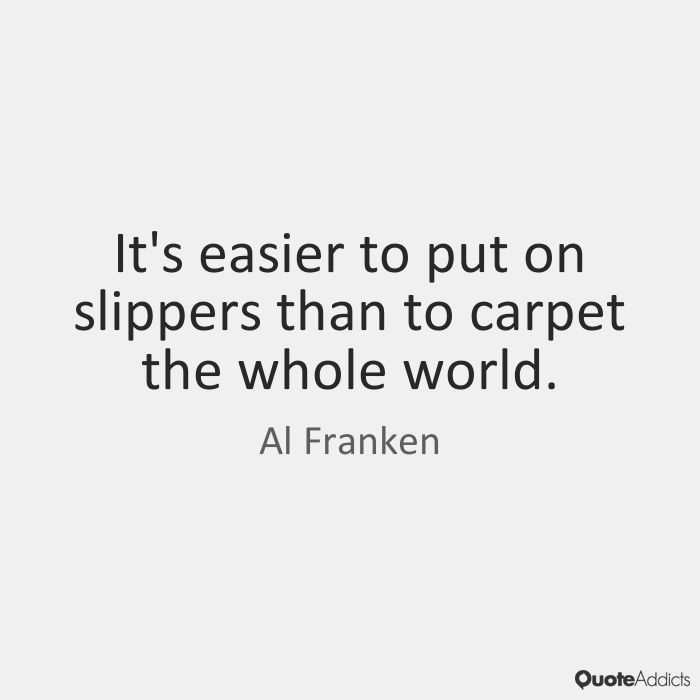 And, I am inspired to keep shifting into the next best expression of who I can be in the world. Yes. Enough martyrdom. More joy. I spent the last two days of my sabbatical in my pajamas. Never got out of them once. It was such a comfy, cozy and caring way to conclude my time tending to me …and … to reflect upon the whole process. And, as I made my way back to work I was sensitive to all the . invitations to resume all my ‘regular’ responsibilities I found myself wondering what parts of my ‘sabbatical’ journey I could ensure I took that I could take with me. I must concede that I really enjoyed the slower and less scheduled pace. 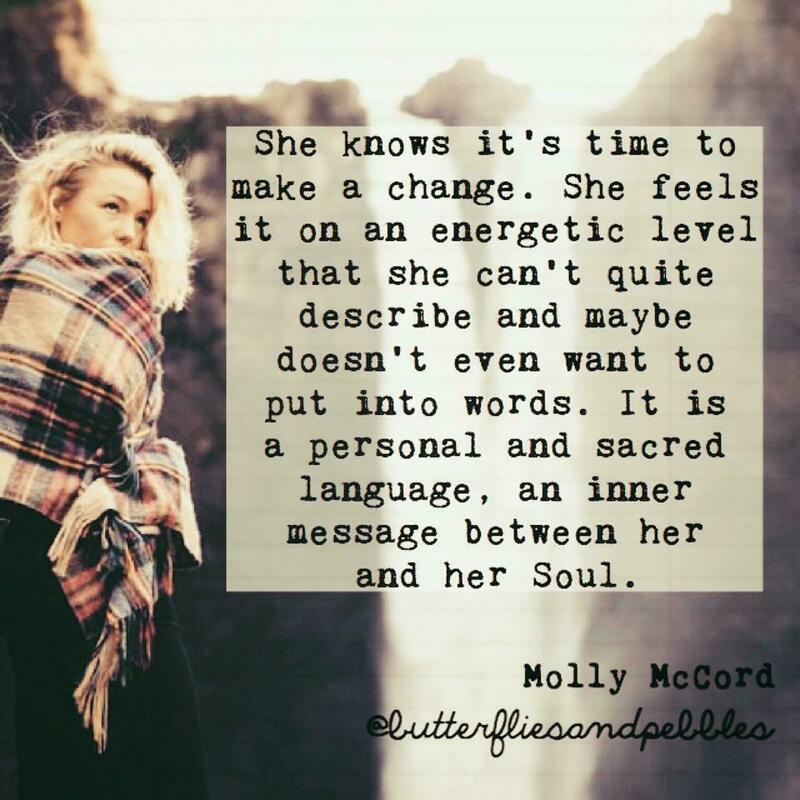 I was really antsy at first, but I got to a place where I could feel a softness in my spirit that disappears when I’m running myself ragged with the shoulds, coulds and oughts. I learned that some of the balls I’ve been juggling can fall. And, I might not need to pick them up again. I’ve learned to hold some stronger boundaries. I really enjoyed sensing the smile sparked in my own soul by answering its call more frequently. I really need more time for me in my agenda. I really need to treat myself with more love and kindness and compassion. I’ve learned that not only my clients deserve the best me I can be … but … so do I. What if …? What if I ensured that the loving and caring and nurturing I gave to others was not at expense to myself (as it does for most martyrs) but rather, was offered from the overflow? What if I made filling my own heart a priority … so full that it might overflow onto every other soul along my path. What if I shared myself more transparently so others were aware of what I am going through? What if I gave myself more space in my conversations? What if I dared to ask for what I needed more often? What if I quit soldiering on when I am tired? What if …? Perhaps the most important thing I have taken away from this experience is this: I don’t really want the energetic resonance I enjoyed in my sabbatical to end. And, maybe it doesn’t have to end. Maybe there are ways I can continue to savor this vibrational frequency for always! And before you know it … and before I have even published this blog … we are nearly all the way through 2017! I am happy to report that I have been more conscious of the way I fill my day-timer though. 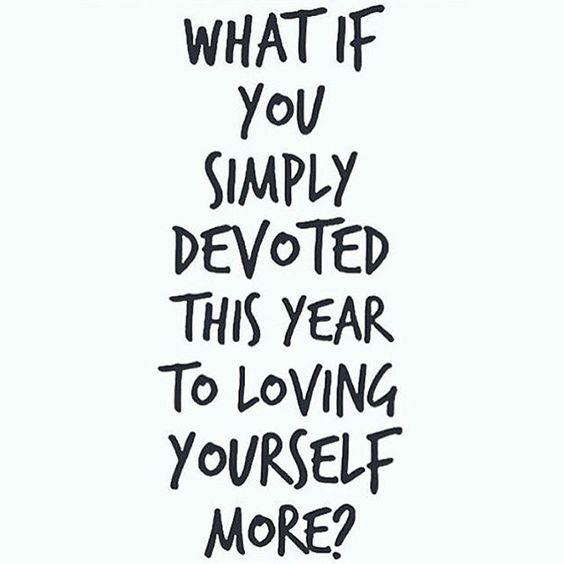 I wanted this to be the year where my own personal renewal was not reduced to a yearly event penciled in as a ‘sabbatical’ … but rather … become a daily, weekly and monthly investment in nurturing my own tender, precious spirit. 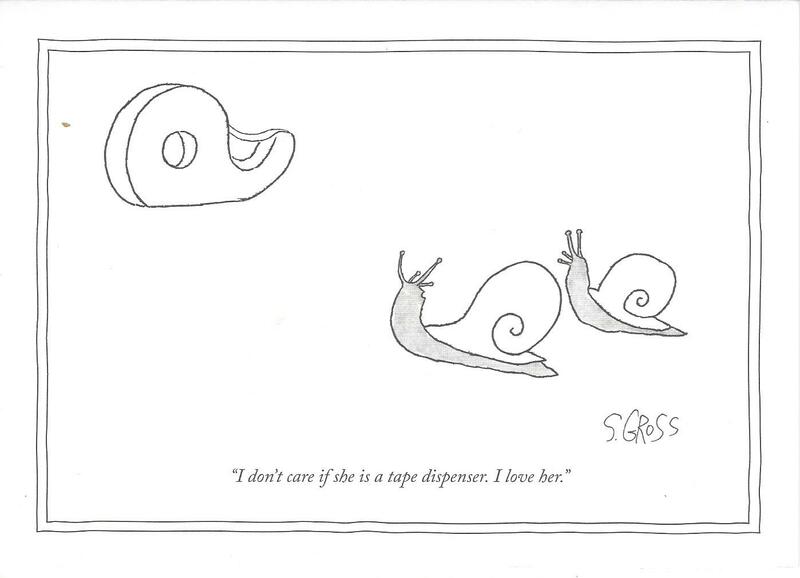 It didn’t always turn out that way. 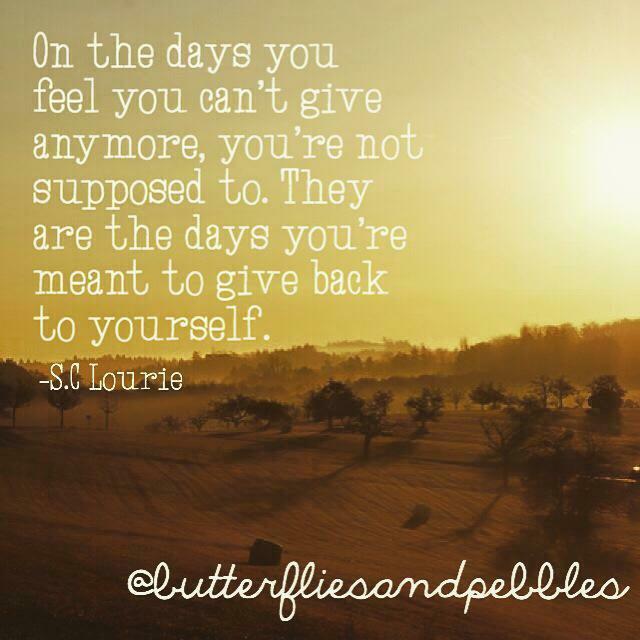 We experienced 3 deaths in our family over a period of 10 month … so … there were times when self-care took the back burner again. But … I have learned that our investment in our personal renewal is an essential gift we must give to ourselves. You are absolutely brilliant and such an eloquent writer, Karen. I look forward to reading your posts as they are courageous, thought-provoking and written with such authenticity. This post resonated with me in a very deep way, as I struggle with my “martyr dragon”. Having said that, t I have been fortunate to have a dear friend who helps me name it when my dragon in all of its glory. Thank you for this gift on this day. With love.